My hat keeps my face protected from the sun while I’m playing in the woods! The weather is feeling like summer (Michigan decided to skip spring), with the sun brightly shining and the temps climbing. Perfect days to be outdoors playing, gardening, relaxing, swimming and more. Perfect time to apply sunscreen! May is Skin Cancer Awareness Month, a great time to pause to remember how easy it is to protect yourself from a preventable disease. Applying sunscreen and protecting yourself from the sun is really easy! And I promise you can still have fun in the sun. I share a lot about my bone cancer diagnosis, treatment and the ups and downs of side effects. While I’m a firm believer that all cancer survivors should have a “one and done” card, meaning you only get cancer once, that wish hasn’t come true. Several years after my bone cancer treatment ended, I noticed a mole on my calf looked odd. Turned out to be early stage melanoma. Thankfully, surgery removed everything and no other treatment was needed. I started seeing a dermatologist who focused on skin cancers to ensure my moles were closely watched. I’ve had many biopsies since that time, with several coming back as abnormal or borderline ‘ready to change.’ It’s simply become a fact of life, and while I don’t like the surgeries or scars, I’d much rather be proactive. That proactive approach worked last year when another biopsied mole came back with the start of melanoma (we thankfully caught it early stage). Skin cancer cases are on the rise in the United States. Five million people will be diagnosed with a form of skin cancer this year, making it the most common cancer in the U.S. The American Cancer Society estimates more than 91,000 people will be diagnosed with melanoma this year, and almost 9,300 people will die from this cancer. Melanoma has become one of the most common cancers in young adults, especially women. Skin cancer is also the most preventable cancer – all the more reason to protect your body from the sun! I am surprised by how many people still don’t regularly wear sunscreen, if at all. Or the parents who don’t ensure their children’s skin in protected. Or the people who think a ‘base tan’ is necessary to protect their skin from sunburns. Any color change to your skin is damage. Don’t forget to protect your skin on cloudy days too. I’m admittedly a tad obsessed with sunscreen. While some people brag about sunburns and tans (sorry, but I just roll my eyes at these Facebook posts and ‘complaints’), my goal is to end Michigan’s summer with zero tan lines and the same pale skin tone as winter. And, no I don’t spend all summer indoors. Between hundreds of miles on the bike and hiking trails, plus gardening, hanging at the pool and all the other activities, relaxation and fun, it takes effort to remain a pretty pale color! Here are a few tips to help protect your precious skin from sun damage and skin cancer risks. I’ll go through all of these (and probably more) this summer. Sunscreen: There are SO many varieties of sunscreen on the market. The most important aspect is ensuring the sunscreen protects against both UVA and UVB. Most sunscreen is available in dry touch so no excuses that sunscreen makes you feel greasy. I know a lot of people like the spray bottles so you don’t have to get your hands ‘dirty’ but keep in mind that the spray might distribute unevenly so I recommend either spraying a lot or still rubbing in to ensure full coverage. Use a minimum of SPF 30 and don’t forget to reapply, especially after swimming or sweating! 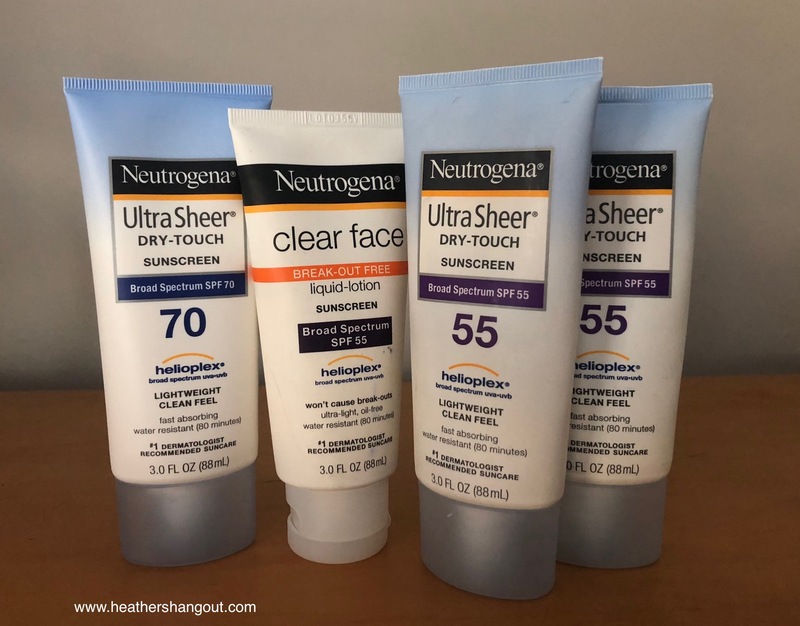 I have sensitive skin and found Neutrogena works great with protection and my skin sensitivity. I wear a minimum of SPF 55 and own a variety of bottle sizes so I can carry in a bag, purse, cycling jersey, backpack, wherever I go. It’s recommended that you use 1 ounce, or enough to fill a shot glass, per application (to cover your body, depending on body type). 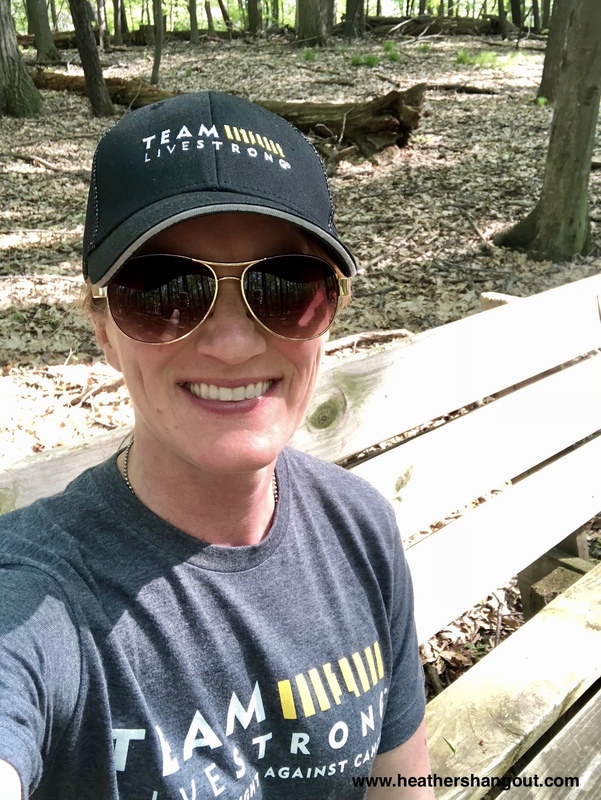 Sun protection clothing: Great clothing options are now available with SPF and UV protection, and lightweight enough to wear during warm weather. I have a few long sleeve shirts I wear while hiking that blocks the sun, yet still keep me cool during activities. I also purchased sun sleeves to wear cycling. These arm sleeves slide up to cover me from shoulder to wrist, and are lightweight enough that I don’t get overly warm. Don’t forget sunglasses to protect your eyes. Hat: I admit I used to be kind of bad about wearing a hat, even though it’s the perfect way to protect your face and scalp. People may think I don’t want to ruin my hair (ha) but I admit that ever since chemo, when I wore a hat often to protect my bald head, I don’t love wearing one. However, I purchased a few baseball hats and cute hats that I’ve been wearing more often, especially when I’m hiking, gardening, on the beach or most places where I can’t hang out in shade. Like I said, it’s such an easy way to protect your face’s skin and your scalp, especially if you’re outside for long periods of time. Supplements/skin care: My doctor recommended I take a supplement that helps repair and protect skin (talk to your doctor before taking any supplements). I also use a night cream to repair any damaged skin (and helps with anti-aging! Yep, you’re learning my secrets to looking youthful.). My morning moisturizer contains sunscreen so I’m protected when I walk out the door, even if I’m simply heading to work. Skin checks: I see my dermatologist every three to six months for a skin check. This is due to my health history so probably not necessary for most people. However, everyone should have an annual skin check. Your primary care doctor can do this, or schedule an appointment with a dermatologist. If you have a family history of skin cancer, I definitely recommend annual checks (talk to your doctor if you need something different/more often). As with anything, you are your own advocate so do your own skin checks and if you see anything suspicious-looking (changes to moles or skin), call immediately. These are tips that work for me to protect my skin while I’m staying busy outdoors. Talk to your doctor about what works for you and other options to safely enjoy the sun and outdoors. Get outdoors and have fun! It is so important to educate people about these risks from sun exposure! Thank you for spreading the word. I need to wear a hat more and get sun protection clothes for when I hike! There are a lot of great clothing choices. Have fun hiking! Wow. Thank you for being so personal and sharing this. I think to is wonderful advice for everyone and I will make sure I take note of this before I head out for a day in the sun!